For the past few years, the media has been reporting on a “brain drain” in Italy, with academics and students worried about the economy, job opportunities and government cuts in research and development spending. However, a recent analysis challenges the idea that the nation’s research community is experiencing a net loss of intellectual capital.The analysis was done by the SciVal Analytics team in Elsevier’s Academic and Government Markets department. 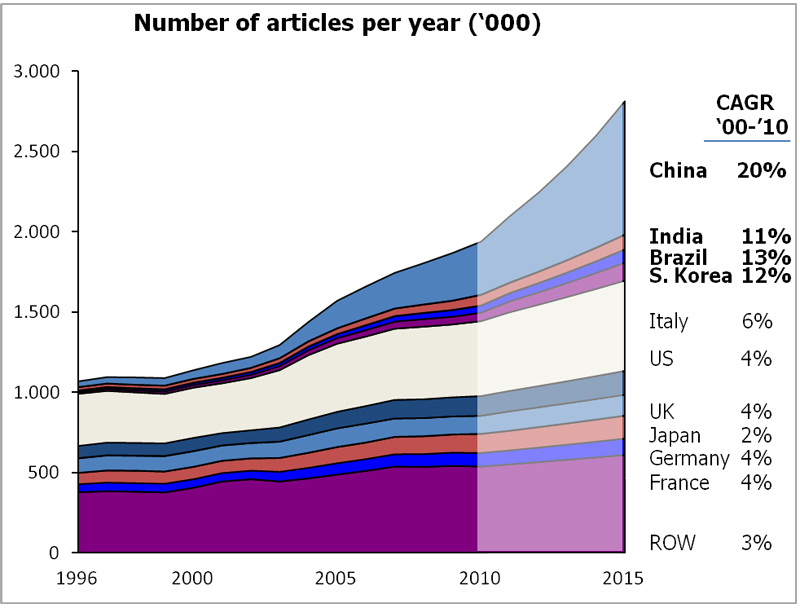 Using data from Scopus, they looked at Italian researcher affiliations between 1996 and 2011. 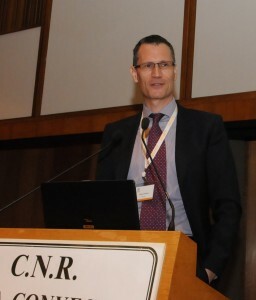 Key findings were presented by Dr. Michiel Kolman, Senior VP of Global Academic Relations at Elsevier, at the National Research Policy Forum in Rome November 14. 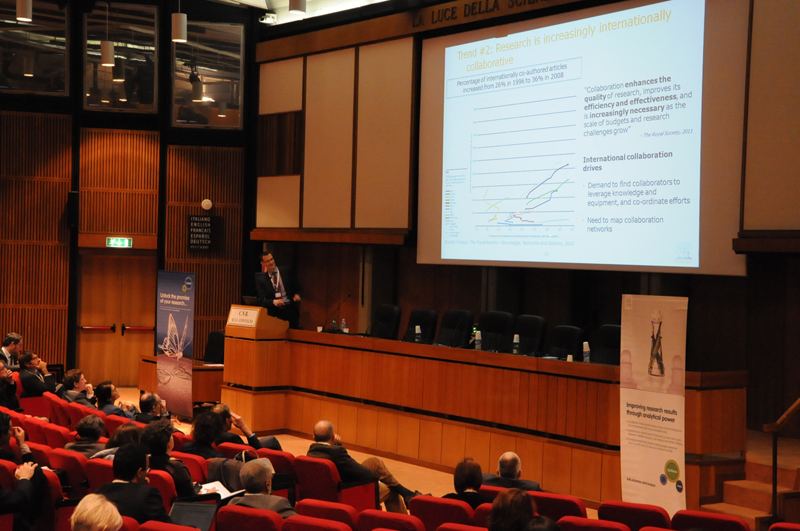 Organized by Elsevier in collaboration with the National Research Council of Italy, the event hosted debates and discussions with politicians, professors, senior researchers, and leaders of universities and other research institutes on how to drive research excellence and innovation at a national level. The event was the first of a series of Research Policy Forums, developed by Elsevier to bring together policymakers, professors and senior researchers to discuss the current state of science at a country-specific level. Each forum in the series will be hosted in a different country and will create opportunities for dialogue between representatives of government and academic institutes. Elsevier’s SciVal Analytics team creates analytical reports for academic institutions, government agencies and corporations worldwide, helping them make decisions about research management, funding allocation, research policies and strategy. Their research experts work closely with clients to tailor the reports, using tools from Elsevier’s SciVal suite to analyze data from Elsevier’s sources (publication and citation data from Scopus and articles from ScienceDirect); macroeconomic data (e.g., from OECD) and the institution’s own sources. The SciVal Analytics team is led by M’hamed El Aisati, Head of Product Technology & Analytical Services for Elsevier’s Academic & Government Markets group. Stable researchers – those who have published exclusively with Italian institutes and universities. Migrants – researchers who have worked and published abroad for at least two years or have permanently moved out of Italy (includes both those starting their careers in Italy and then settling abroad, and those starting abroad and returning to Italy). Looking at the two flows of migrant researchers (the 5.1% outflow and the 4.3% inflow) we saw that, although there is indeed a net outflow – or brain drain – from Italy, it is very small in size (0.8% of the whole group). 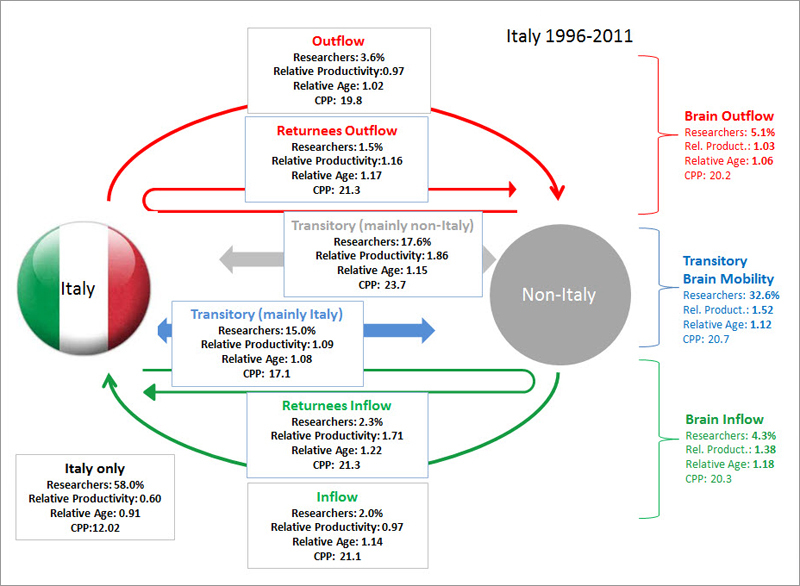 Furthermore, the scientific impact measured for the two flows is almost identical, while the overall seniority of the researchers moving to Italy is even higher than that of the ones settling abroad.We concluded that the brain circulation phenomenon has a positive outcome and plays a key role in the internationalization of research, which is crucial in the globalized landscape of R&D. 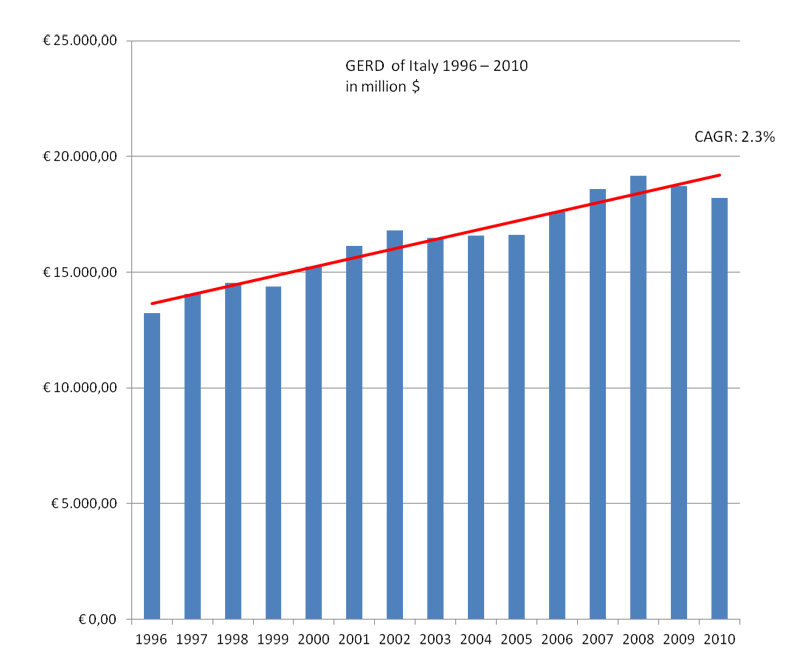 For this reason, we think policymakers should be encouraging brain circulation rather than worrying about it.In addition, our findings showed that Italy grew its expenditure in research from 1996 to 2010 on average by 2.3 percent per year, although in the last two years, the trend has become negative. At the same time, the scientific production of Italy in the same period grew an average of 6 percent a year — almost three times faster than the overall budget growth and higher than other research-intensive countries such as the US and UK. 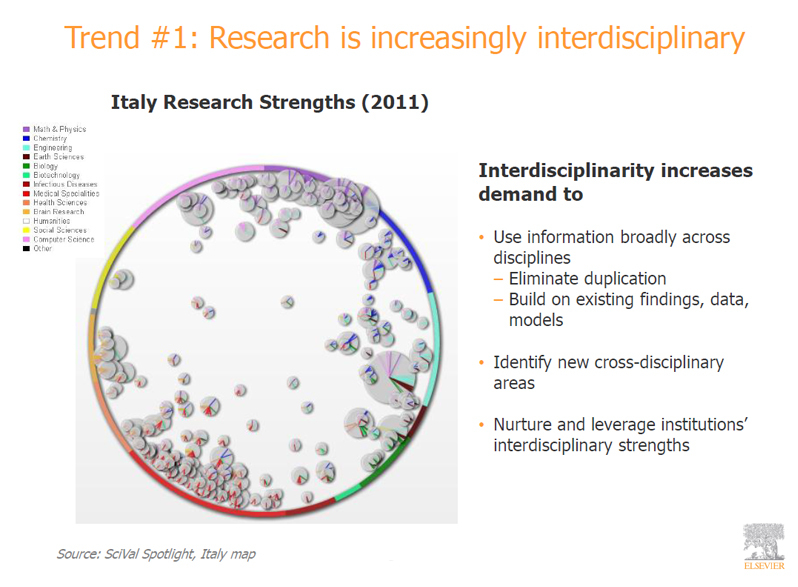 Research in Italy has also become increasing interdisciplinary, as shown by a 2011 study conducted by Elsevier. This trend can be seen on the SciVal Spotlight country map for Italy, which shows scientific production from 2007 to 2011. Dr. Andrea Bonaccorsi, Executive Board, National Agency for the Evaluation of Universities and Research Institutes (ANVUR) and Full Professor at the University of Pisa. Dr. Cornelis A. Van Bochove, Professor of Science Policy at the Center for Science and Technology Studies at the University of Leiden in the Netherlands. Dr. Dario Braga, Professor of Chemistry at the University of Bologna and Vice Rector for Research. 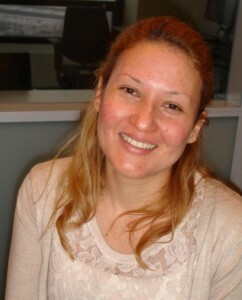 Dr. Emanuela Reale, political scientist, Senior Researcher at the Institute for Economic Research on Firms and Growth (CERIS) – National Research Council of Italy. Dr. Michiel Kolman, Senior VP of Global Academic Relations at Elsevier. Dr. Luis Sanz-Menéndez, Director of the Institute of Public Goods and Policies (CSIC) in Spain and Chair of the Committee of Scientific and Technological Policy of the international Organisation for Economic Cooperation and Development (OECD), had to cancel due to a strike in Spain that affected his travelling. Claudio Colaiacomo, Regional Director for Southern Europe at Elsevier, manages a team of 10 people to coordinate the marketing and sales activities on over 200 universities and research centers. 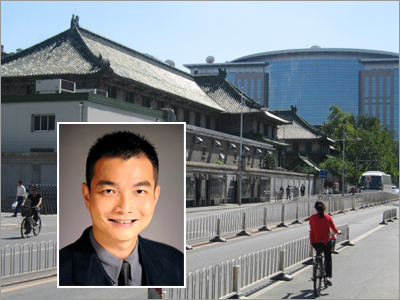 He has been working for Elsevier since 2005 covering various roles. He Lives in Rome and holds a BS and Masters of Science in Physics. What I miss in this study is information relating to those graduating from university in Italy. If you look only at researchers, you are looking at the people that have already 'made it' to a certain level. How about the graduates that never manage to get a research position? How many of them do not decide to leave their country for personal reasons and instead take a job that is 'below' their capabilities? While these people do not actually leave the country, their capabilities may be under-utilised. This represents a brain-drain not only for Italy, but the whole of the scientific community. We did not look at the population of graduates not pursuing a research career. The aim of our analysis was to somehow question the statement that the best researchers are leaving Italy and that there is a significant brain drain going on. Our data from 1996 to 2011 do not confirm this trend. Anyway, yours is a very interesting suggestion and could indeed become the focus of a dedicated study: we would need, though, to integrate an external data source to get the number of graduates.